TalkTalk broadband, TV and home phone packages – Are they any good? A major landline and broadband provider in the UK, TalkTalk offers its homephone bundled with standard broadband or fibre broadband. TalkTalk also offers exclusive TV packs to its customers and has become a leading triple-play service provider in the UK market that was earlier dominated by BT, Virgin Media and Sky.TalkTalk fibre broadband is delivered via BT’s FTTC network and has a coverage of more than 95% of homes in the UK. Both its services – Faster fibre (35Mbps) and Faster fibre with speed boost (63Mbps) can be added on top of its basic TV or TV Plus packages. The add-ons and boosts are available to the customers who want to upgrade to faster internet plans or add unlimited calls/international calls. New wireless Super router, YouView+ TV with Select TV and HomeSafe internet security are great features that add value to TalkTalk brand. Superfast fibre broadband is available to new and upgrading customers. Flexible ‘boosts’ allow users to add specific call plans or popular channels like Sky Sports on a minimum 1 month contract. All TalkTalk packages come with all in pricing, meaning, the monthly price includes line rental to help you identify the actual cost of the service without any difficulty. Customers who terminate their service before the expiry of contract, will need to pay for the months left on the contract. TalkTalk fibre broadband which has an extensive coverage over the UK, is one of the lowest priced, superfast broadband options available for the UK homes. With affordable pricing range, it comes with simple range of packages which can be customised by adding call and TV boosts that come with flexible contract lengths. What’s more, you can add internet security and other features or buy or rent on-demand videos and movies from TalkTalk TV store at amazing pricing. TalkTalk offers unlimited fibre broadband with options to choose speeds – 35Mbps or 63Mbps which are average speeds that half of the customers can get at peak time. While 18 month contract is standard, you can also choose 12 or 24 months. Prices which are fixed for contract length, include line rental. Whether you choose Faster fibre (35Mbps) or Faster fibre with Speed Boost, you get similar features like unlimited downloads, pay as you go calls, free Super Router and HomeSafe online security, except that the latter offers you average download speed of 63Mbps. According to Ofcom 2018 report, TalkTalk Faster fibre offered an average speed of 32.3Mbps while average speeds on TalkTalk 63Mb broadband lines stood around 52Mbps during peak times (8pm – 10pm). With TalkTalk fibre broadband, you can add more features like calls, speed upgrade and online security. Easy to add or remove as you wish at anytime, these extras come with flexible terms. You can add unlimited UK calls and mobile calls or international call plans at anytime. They are so flexible that you can cancel at anytime with one month notice. If you are on faster fibre package but need faster speeds, you can just upgrade to 63Mb plan without any hassle. Likewise, you can enable online security for up to 8 devices with additional subscription. TalkTalk TV is the cheapest triple-play TV, broadband & phone option for UK homes that need to pay more for such packages when taken from Sky, BT or Virgin Media. TalkTalk TV was launched much later than its rivals, however, the service has become quite popular, thanks to the huge take up in the last two years and good customer satisfaction levels reported by the industry regulator Ofcom. You can choose from two TV bundles which you can customise with broadband speeds you need – either standard (11Mb) or fibre (35Mbps/up to 63Mbps). Again, there are only PAYG calls with bundles means you can add call boosts that suit your phone needs. TalkTalk TV package includes Fast broadband or Fibre broadband, PAYG calls and more than 80 Freeview channels, including 15 HD channels. Contract length will vary depending on the broadband package you choose. With TalkTalk TV, you get free, pause & rewind live YouView TV box. TalkTalk TV Plus offers similar features, however, you get 15 extra channels and YouView+ box which can record up to 185 hours of TV along with pause & rewind functionalities. 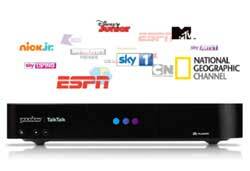 TV Plus pack includes Sky Entertainment channels along with 80+ freeview channels. Contract terms are flexible – you can choose from 12, 18 and 24 month contracts. TalkTalk TV packages come with 11Mb Fast broadband as standard, however, you can take up Faster fibre (35Mb) or 63Mb fibre at any time, by adding the boost. You can add your favourite channels or just remove them every month. Entertainment channels include Sky 1 & 2, Sky Living, Nat Geo Wild, MTV and more. Kids TV boost include 200+ TV shows including the popular channels like CN, Disney on demand and Peppa Pig. Sky Sports includes all Sky sports channels which allow you to watch F1, rugby, international cricket and foot ball events and all 4 golf majors. Sky Cinema boost offers access to 11 Sky Cinema channels, 1000+ on demand movies and a new premiere every day. You can pick a triple-play bundle that includes fibre broadband, calls and TV packs from TalkTalk which offers two TV deals. You can just choose the basic TV which includes YouView box which comes with pause and rewind feature. By contrast, the slightly more expensive, Plus TV includes extra Sky channels and YouView+ box with additional recording feature. TalkTalk offers free wireless routers and free connection on selected packages.Parental controls (HomeSafe), optional Mobile SIM and anti virus for device are included. Totally unlimited usage applies to all packages. However, connection may be slowed during peak time (3pm – midnight) if users exceed fair usage. Only P2P traffic will be managed during these hours. TalkTalk deals are indeed suitable for families that are looking our for the best and cheapest broadband and phone offers. The ‘boosts’ just help users to add call plans and TV channels flexibly, without committing for a long time. TalkTalk gained good ratings when it comes to value for money, reliable service and security features. Our review of TalkTalk broadband. TalkTalk is currently the fourth largest fixed broadband provider after BT, Virgin Media and BSkyB and offers its broadband (ADSL 2+ and fibre) and phone service via its LLU (local loop unbundling) network. TalTalk, the demerged company from the Carphone Warehouse, also includes the customers from the old Tiscali broadband provider. Talk Talk has been offering broadband and phone service for nearly a decade. Unbundling thousands of BT exchanges, it has over 98% of coverage in the UK.